The Song of Australia was the result of a competition sponsored by the Gawler Institute in 1859 to celebrate its second anniversary. There were 96 entries but it was the five verse song, written by English-born poet, Caroline J. Carleton which was awarded the first prize of ten guineas. 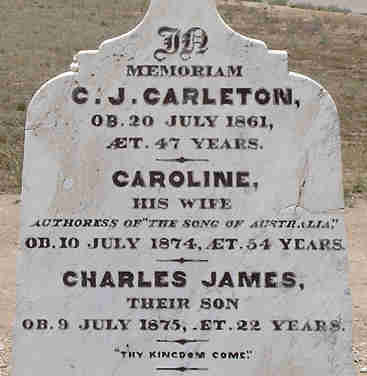 Caroline Carleton (1820-1874), daughter of bookseller William Baynes of Middlesex, and her husband Charles James Carleton, arrived in South Australia from England in the Prince Regent on 26 September 1839. Their two children had died during the voyage. The Carletons lived in Adelaide for some time where Charles practised as a medical officer. Between 1855 and 1861 the Carletons lived at the West Terrace Cemetery where she wrote her song in 1859 while looking after her husband and their five children. They later moved to Kapunda where he had a similar position at the mines. After the death of her husband, on 20 July 1861, she started teaching but later, due to ill health, moved to Wallaroo where here daughter was teaching. Caroline died at Matta House on 10 July 1874, to be remembered as a clever, courageous, kind and courteous gentlewoman. Her admirers later had a monument placed over her grave at Wallaroo. The music for the Song of Australia was composed by Carl Linger (1810-1862), who also received a prize of ten guineas. Berlin-born intellectual Carl Linger, who had studied at the Institute of Music in Berlin, came to South Australia in 1849 with his wife Wilhelmina on the Princess Louise. He settled in Gawler, grew potatoes, went broke and settled in Adelaide. Here he was far more successful. He was the founder and conductor of the German Liedertafel in 1858 and composer of church music, including the Ninety-third Psalm, Gloria, O Lord who is as Three and Vater unser. For several years he played the harmonium at St Frances Xavier Cathedral. When he died he was buried at the West Terrace Cemetery. Later, as part of the State's Centenary, a monument was built on his grave. The Song of Australia impressed Charles Cameron Kingston, the Premier of South Australia, so much that he asked public school teachers to teach it to all their students. It never became Australia's National Anthem though as the Commonwealth government preferred Advance Australia Fair, composed in Sydney in 1878. Caroline Carleton also wrote a commemorative work about John McDouall Stuart on his successful crossing of Australia in 1862 and again on the tenth anniversary of his achievement. same title but vastly different content.